My life before him was so simple. And now there’s just . . . After. 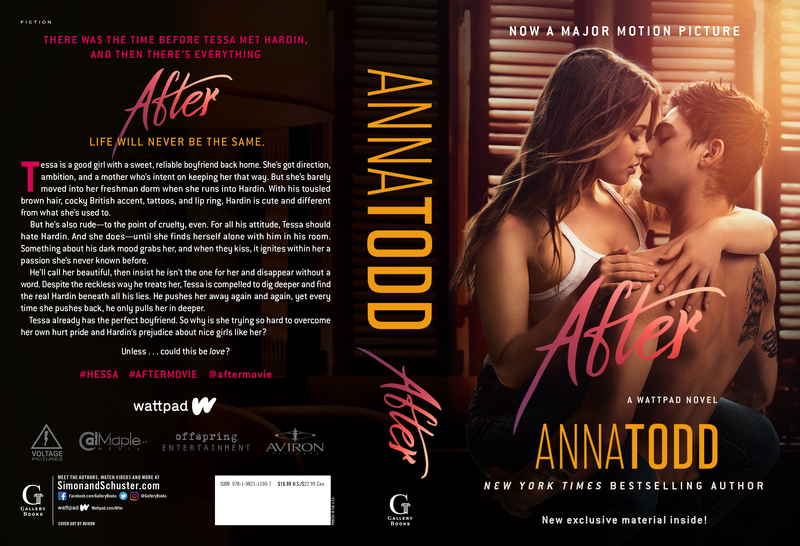 AFTER, soon to be a motion picture, from #1 internationally bestselling author Anna Todd, is coming to theatres April 2019, and we have the special edition movie tie-in cover! But she’s barely moved into her freshman dorm when she runs into Hardin. With his tousled brown hair, cocky British accent, and tattoos, Hardin is cute and different from what she’s used to. Download the digital version today! Anna  Todd  is the  New York Times  and #1 internationally bestselling author of the After series. An avid reader, Anna began writing stories on her phone on Wattpad, the reading and writing multi platform for original stories, with  After  becoming the most read series on the platform with over 1.5 billion reads. The print edition published in 2014. AFTER has been published in over 30 languages, with more than 10 million copies sold worldwide, and is a #1 bestseller in Italy, Germany, France and Spain. The film adaptation of AFTER, which Anna is co-producing, is set to be released in April 2019. Anna  and her husband currently live in Los Angeles. Find her at AnnaTodd.com, on Twitter at @imaginator1d, on Instagram at @annatodd and on Wattpad as Imaginator1D.